"We would love to hear from you about the new site. Do you find it easy to navigate. If you find any typos or have any suggestions let us know. The pictures above and below are of the old site." AIU gets a new look. 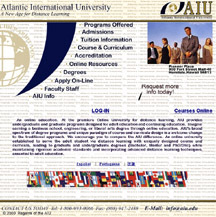 You are currently in AIU's new web site. As an online distance learning based institution we are always striving to inprove our web presence. The IT department has been working to improve functionality and ease of use for its students and prospective students. 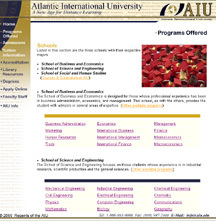 The results are evident in this new state of the art format incorporating flash, database integration, new alumni outreach and a news section to keep you informed of what is happening at Atlantic International University. As with all things new there are still many things that can be improved and corrected to make the service and experience as best as possible to all. An important part of this continuous process is user feed back. If you have some constructive criticisim or general suggestions please let us know. Feeling a bit Nostalgic, want to visit AIU's old Web Site?